Recently, I reread The Monster at the End of this Book for school (yes, it’s good to be in an MFA program!). Now, it’s not like I hadn’t read this book an untold number of times before, both when I was a kid and to my own kid. It’s a serious good time as a read-aloud, as now two generations of my family can attest. Here’s what I discovered when looking at it this closely: it’s a brilliant book. Really brilliant. If you’re going to adhere to Leonard Marcus’s words about a picture book being a dialogue between words and pictures, author and child, well this is the ultimate dialogue. Grover begins this dialogue on the cover of the book, and immediately digs into the emotional problem of the story with, “WHAT DID THAT SAY? On the cover, what did that say? Did that say there would be a Monster at the end of this book?? ?” Why yes, it did say that. And who can resist wanting to know more? Especially since the book asks kids to become direct participants in the emotional problem and in the resolution. Grover tells the child reader, “Listen, I have an idea. If you do not turn any pages, we will never get to the end of this book.” And you just can’t help it—you have to turn the page. Turning the pages means you’re participating in the joke. 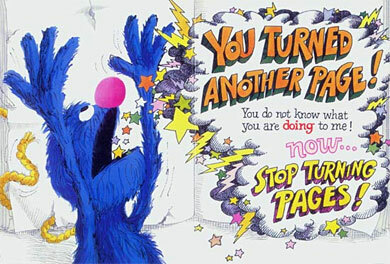 Kids know that Grover will be the monster at the end of the book, even if Grover doesn’t, which turns any potential worry about turning the pages despite Grover’s pleas into humor in a nonthreatening way. On an even deeper level, the dialogue in this picture book also has to do with expectations. Set up to mirror the houses built by The Three Little Pigs, Grover first ties the pages together with rope (straw), then gets nails and wood to fasten them together, and finally creates a strong brick wall to keep the pages from turning. 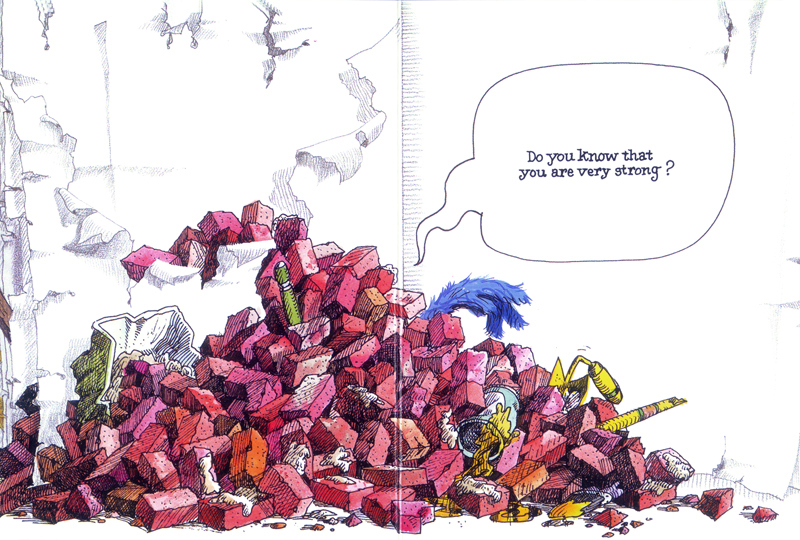 From their knowledge of The Three Little Pigs, children are led to think that perhaps the brick wall might actually do the trick and stop the book in tracks. When the wall comes tumbling down kids get the added thrill of upended expectations. 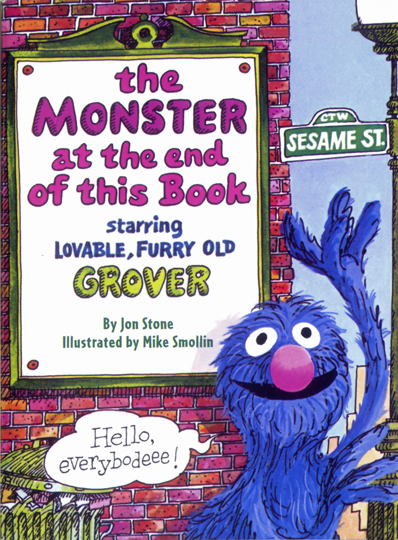 In the end, when Grover discovers that “This is the end of the book and the only one here is ME!”, kids get the satisfaction of seeing Grover realize what they knew all long—and the reassurance that fears of monsters are unfounded and often just plain silly. It’s comfort for a common fear delivered with a giant spoonful of goofy, funny sugar to help it go down.